Making businesses better through continuous improvement, visual management, great software and better teamwork. Flight Control by Meshninety is a comprehensive online and in-person programme that will let you put business improvement at the centre of everything you and your team do. You pick when and where you start making your improvements happen. Access all of the worksheets, downloads and videos forever. Receive all the updates as they happen. Any online step-by-step guide to all you need to know to make lasting improvements. Stay in touch with the online community to get support and share ideas. We walk you and your team through the programme and get you up and running. In-person guidance to set up each step of your first improvement project. You keep the templates and worksheets to keep improving. Weekly one-on-one calls to help keep your project on track. Meshninety has given us a lot of help to choose and implement the right tools and give me the visibility I need to manage my business remotely. They’re great to deal with and always give me advice I can trust. Meshninety is a company that specialises in advising businesses on their software and processes so they can save time and money. 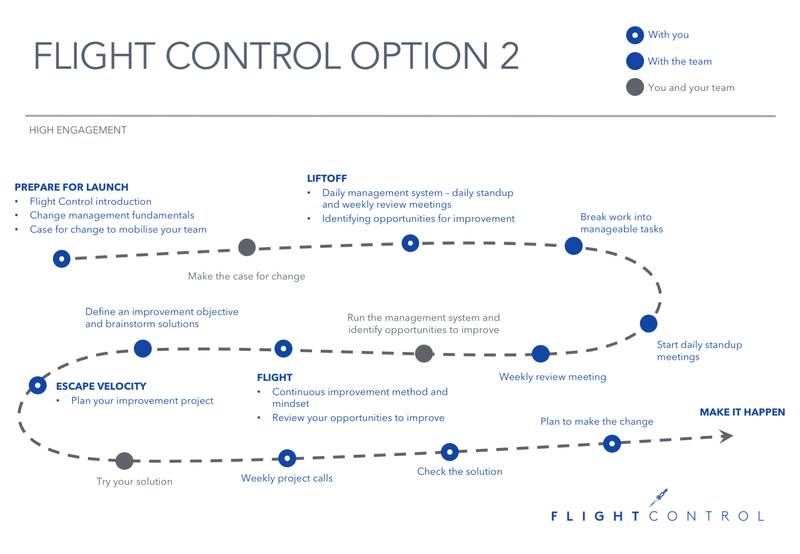 Flight Control was born after we identified that a lot of companies weren’t making changes in a way that worked for their businesses. By systemising much of the groundwork we usually do with clients, we can offer it at far more competitive rates while allowing us to serve more clients at the same time. No. In Flight Control we suggest a number of off the shelf products that are free to use and very popular worldwide. There are upgrades available for these but you probably won’t need them and we make no financial gain if you do. Most likely! 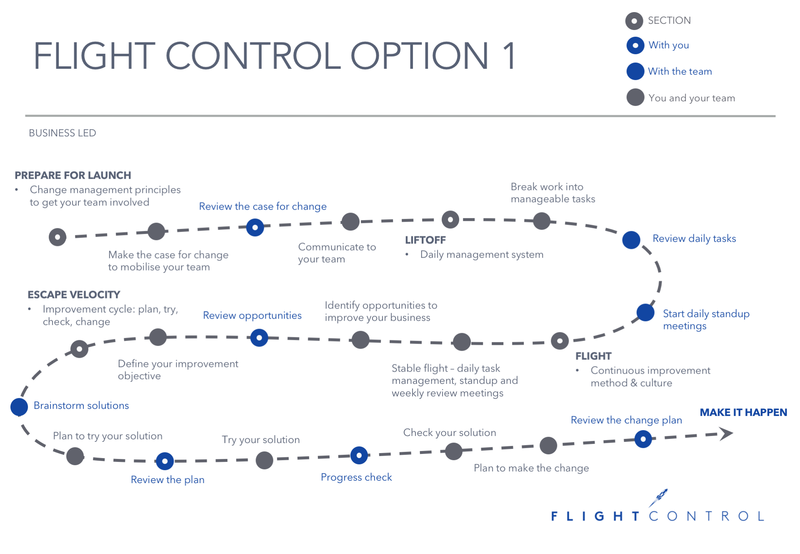 Flight Control gets you and your team ready to solve whatever problems that your business may face. You will find out how to get to the root cause of your problem and then systematically work the solution and get it embedded. Any if the problem is software or process related then Meshninety will be on hand to give you a hand. We should have your new daily management system going no later than two weeks after sign up. We take a couple more weeks to make sure it beds in and then we get into your first continuous improvement project. Then it all depends on the size of the project. This depends on you, the programme you choose and the complexity of your business. The beauty of Flight Control is that it saves you time so after a few hours of initial work you will start getting the benefit of visual management and enhanced communication. Will I get access to the material after its over? Yes! You’ll be part of the community and have access to everything new generated even after your programme finishes. We will be constantly adding new materials and extending the course to provide even more value to our clients.